I can’t really recall why I thought of Indonesia at the first place. But now I can give you 10 reasons why you should decide on Indonesia. We spent 15 days in Indonesia, travelled to 10 destinations and hopped 4 islands. It was super exciting to pack every morning and relocate to a new location, in order to catch up on everything we can in the limited time we had. Each sunset had different colours and views that filled us with a feeling of satisfaction. By the end of the day, we would sit on a beach side shack, listen to the sound of waves come and go, and be ready for next days adventure. I will take you through the 10 destinations we visited with some important details and highlights. Also share tips on how to save your money while travelling in the country. In the end, I’ll reveal my whole expenditure. Keep reading and enjoy the visual journey, I hope it helps you decide your next holiday destination. It was a sunrise spot that overlooks Mt. Bromo. After our 11hrs flight from New Delhi> Jakarta> Surabaya, we took a 3hrs Volvo bus ride to Probolingo. We booked Mt. Bromo visit package with a local travel agent. It is sunrise sight so we had to stay overnight at a base point, from where the cabs leave at 3am for Mt. Bromo. It is one of the most popular tourist places in Jav. People in large numbers come here to witness the first rays of sun on Mt Bromo and the view is worth the midnight rush. This view is from Mt. Penanjakan viewpoint that can be easily accessed by Jeeps and than few steps upwards. It’s amazing to witness something you have only imagined. An active volcano with the power to destruct all it’s surroundings and fill the air with acidic fumes. It’s an example of how Mother Earth is a creator and a destructor too. To see the blue flames in Ijen Crater we had to leave from the base at 1am. It is a little more than an hour’s drive and then 2hrs hike ahead. It was my first night hike, and I loved every bit of it. The forest trail, narrow steps and Milky Way in the sky has pictured as a great memory. Once we reached into the crater, the sky was still dark and we could actually see the blue flames coming out of earth’s crust. After few steps of hiking back, we turned around to have a last glance at the sight. It was almost dawn and to our surprise we saw a acidic emerald green lake that was right in the center of the crater but wasn’t visible in the dark before. Our visit to Ijen crater was included in the same package. The whole package included: Stay at Mt bromo base, Mt Bromo tour, transfer to Ijen Crater base, Ijen Crater tour and transfer to the port. Seminayak is a place with all things pretty. It is one of the most visited places in Bali. It is the ideal destination for people who are looking for boutique shopping; amusing party life, cool shacks to chill by and vast beaches for a good swim. It is a shopping paradise and is spread with long market lanes, offering variety of art pieces, home décor, clothing and accessories. Seminayak markets also have various food stalls with almost all cuisines. It is kind of a luxury end of Bali with all the fancy 5 star hotels and resorts. Ubud is known as the center for traditional crafts and dance. Few of the things Ubud is particularly famous for are the rainforest and terraced rice paddies, dotted with Hindu temples and shrines. We also noticed a lot of huge Hindu idols on roundabout and across the road. Apparently, a lot of Ubud citizens are followers of Lord Ram. Ubud main market proposes variety of good restaurants, cafes and streets of shops. A lot of regional artist’s from all around Indonesia come to sell good goods and creative items in Ubud. You can’t eat at all restaurants, but you should definitely take a walk in the lanes as each restaurant/outlet is offering something new or different. Apart from the home country culture, you can also see influences from different parts of the world. A lot of people from Australia, Thailand, Malaysia and other neighboring countries have invested their business in Ubud because of it’s wide reach. It is not one destination but the 4 waterfalls we visited in Bali. Bali is brimmed with secret waterfalls and we were very careful selected the 4 of them considering the limited time we had and also that can be covered on our route. Tukad Cepung Waterfall: was the first waterfall to start with and it’s my personal favourite. We started from Ubud in the morning; it is almost an hour’s scooter ride. After parking our vehicle took a 30mins walk in the forest trail to reach to this hidden waterfall that lands inside a cave. It is also known as a virgin waterfall. There is a river that flows above and because of the hole in the caves it comes down and forms this secret waterfall. The water flow depends upon the river that can go high sometimes. Aling Aling Waterfall: We visited this waterfall on our way to North Bali from Ubud. It is one of the longest waterfalls divided into 3 sub-waterfalls as big stairs. The 1st one (in the picture) is the highest with a smaller pool. Whereas the other 2 are shorter in height but with larger pool to dive and swim. People often come here to enjoy water activities like cliff jumping and sliding. All the three waterfalls are connected by a beautiful trail, with water running side by. Wane Ayu Warerfall: This waterfall is a statement of how secretly beautiful Bali is and how it’s not made a big deal. The waterfall exists in a small village called Kubu Tunuh, exactly 1 km from the Village center Padangbulia. The local village people helped us with the directions. You can hear the waterfall sound from the parking area. When we reached the to fall, we were the only one there and we had this beautiful spot all by ourselves. The waterfall is maintained by the local village people, and can be visited by anyone without paying any ticket. 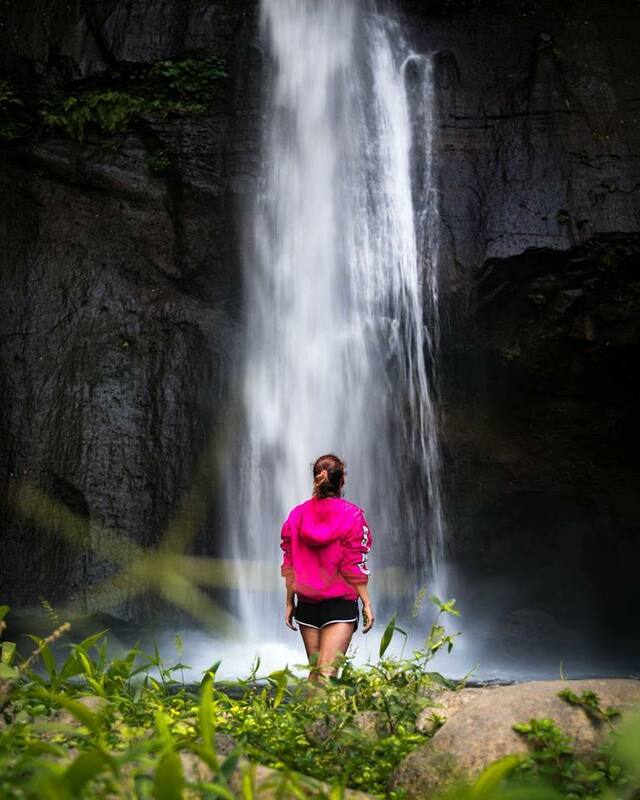 Git Git Waterfall: Hidden deep in the mountain forests of Bali, Git Git Waterfall is another island’s lesser-explored area with pleasant green trails and soothing sound of natural waterfall. The waterfall was easy to locate and access because of it’s direct connectivity to the main road. It is located on the edge of the highway Denpasar- Bedugul- Singaraja. The Git Git Waterfall further divides into several waterfalls in different directions. It is a refreshing experience to walk on a trial with coffee and clove trees along with water stream by the side. Pura Ulun Danu Brata Temple: located on the shores of Lake Bratan in the mountains near Bedugul. Built in 1633, this temple is used for offerings ceremony to the Balinese water, lake and river goddess Dewi Danu. Due to the importance of Lake Bratan, as a main source of irrigation in central Bali. The 11-stoery Pelinggih Meru in the complex is dedicated to Shiva and his consort Parvathi. Buddha’s statue is also enshrined in the temple. Lake Bratan is known as the “Lake of Holy Mountain” due to the fertility of this area. Located 1200m above sea level; it has a cold tropical climate and is a picturesque spot. Handara Golf and Resort: is a Mountain Golf Resort. We took a quick visit to this palce as it is one of the biggest and oldest Balinese Gate. The Golf complex has lush tropical gardens, amazing mountain scenery and cool weather. Balinese Gates are something you will find all across Bali, on road sides, temple entrances, even most of the home’s have Balinese Gates. Often served as gate guardians as twin dvarapalas flanking entrances. Balinese architecture is developed based on the social relationships, philosophy, spiritual beliefs, and Balinese Hinduism. After our long scooter ride starting from Ubud we reached Lovina later in the evening. The whole purpose for visiting Lovina was to watch schools of dolphins jumping and swimming side by. Another highlight of this place became these adorable boats with wings on sides, for better balance I’m guessing. Our boat was called Popeye, and it gave me one of my favorite memories from BALI. Out of the four islands we covered on our Indonesia trip, Nusa islands were the one I was looking forward to the most. During the research on Indonesia, I had seen a lot of beautiful cliff points facing the ocean in Nusa Islands. It is an hours boat ride from Sanur, Bali and is much less exposed to tourists. Hence the stay and food is comparatively cheaper here. It has one of the best cliff views and scuba dive points. We took a scooter for 3days to roam around the island and I have to say the stunning views will leave you hypnotised. Atuh is still an unexplored beach side in Nusa Penida and can be reached by 2hrs drive from the port. The road gets rough in the last 30-40mins patch as it is still an underdeveloped area. But that’s the beauty of Atuh. Angels Billabong is a natural infinity pool. It is located towards the North-West of the island. There are two ways to reach there- 1. Join the guided tour, 2. Scooter ride. The road in between can get rough with rocks and ditches. But that’s how we did it. Broken Beach is a walk away from Angels Billabong, it is another beautiful cliff looking down at a rock structure that appears like a Huge Gate welcoming the ocean waves inside. Kelingking Beach, the sunbathing T-Rex, is Instagram famous coastal cliffscape. There is a short trek down the spine of the T-Rex that leads you to the beach below. The trail is narrow and steep, and has to be crossed very carefully. Destination 9: Nusa Lembongan and Nusa Ceningan. Nusa Lembongan can be reached by a boat ride from Sanur, Bali and Nusa Penida. 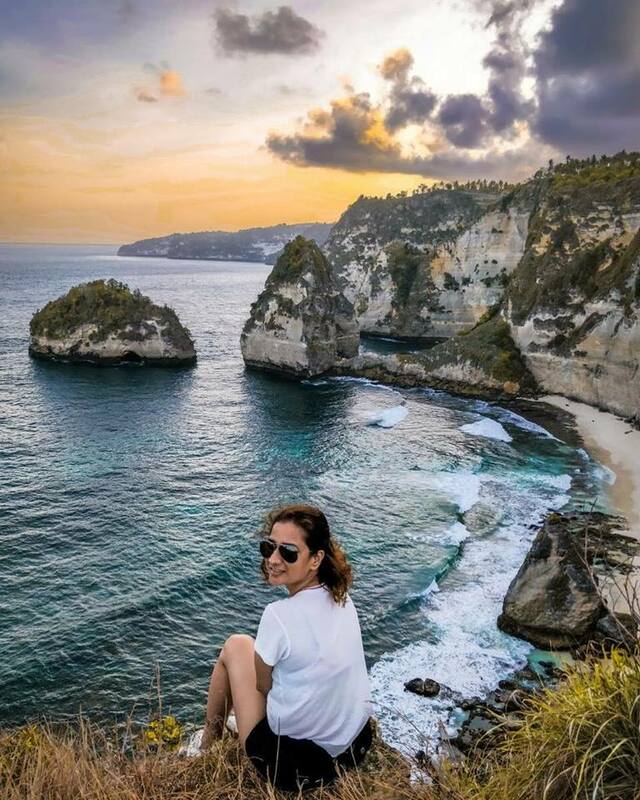 Both the islands Nusa Lembongan and Nusa Ceningan are connected by a bridge and can be explored in a day if planned well. 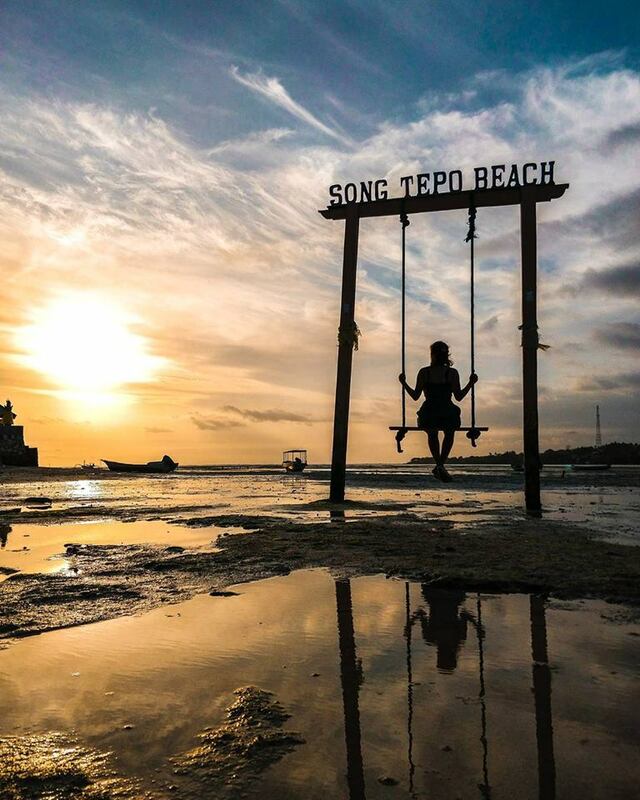 Of all the three Nusa Islands, Nusa Lembongan is the most popular one. It has a lot of good hotel and cafe options. You can also sign in for a Scuba Dive here, which will take you to Manta Point- one of the best dive points in Indonesia. Manta point is actually located in Nusa Penida, but is accessible from Nusa Lembongan too. So it’s your choice from where you start it. When in Indonesia, you must reserve your evenings for sundowner. It’s a sight to see and adore the avian beauty of how sun leaves it’s colors in the sky after it sets. There are few sightseeing points that look wide at the coastline and serves as a potential background. ili Islands is an ultimate weekend getaway from Bali and Lombok. The three little inlands are located off the coast of Lombok. We travelled to Gili islands from Bali through fast boats from Padang Bai. Gili Islands are no motor islands. They are to be explored either on foot, bicycle or horse cart. The idea is to preserve the place, keeping it pollution free and nature friendly. All three Gili islands have very small landmass and it’s a lot of fun to be bicycled around. While Gili Trawangan is more about fine restaurants and party life, we spent most of our time in Gili Air enjoying our tranquil time. Snorkelling in Gili: There are a lot of Snorkeling spots in Indonesia, we chose to do it in Gili Islands. The snorkeling tour starts from Gili T and goes around Gili Air and Meno. It covers almost 4 dive points with unique highlights. I have snorkeled before but this experience was so much more exciting as it started to rain insanely after our first point where we snorkeled with the turtles. We were not sure if we will go ahead with the tour, the clouds seemed heavy and the boat was jumping with high waves. But our guide took us to rest of the points and we were just looking at him, thinking if he is sure of what he is doing or are we put on a risk. We were left with very few days on the island so we decided to just jump in- join the adventure. The spot in the picture is an underwater sculpture of 48 life- size figures, close to Gili Meno. In the end, It was a risk worth taking and a memory worth keeping.